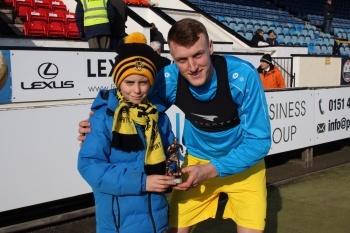 Ahead of Southport’s match against Curzon Ashton on Saturday, Jack Sampson was presented with the Trust in Yellow Player of the Month for January. Sampson scored four goals in five games during a month that saw the Sandgrounders turn their form around by registering three wins. The striker scored twice in the win over Stockport County and has become an increasingly important part of a team in which he is the only player not signed by manager Kevin Davies to still feature regularly. He came out on top in the supporters’ poll and was presented with his award before kick-off by young fan Jack Pearce. Unfortunately due to very low bookings we are unable to run a coach to Saturday’s match at Blyth Spartans. The weather forecast is very poor for that area later in the week and it seems likely the match could be postponed anyway which may have deterred people from booking. We did receive a generous donation from a member towards the cost of the coach but after discussion he agreed to move that forward to the York City coach so we are now in a position to say that this coach on Saturday 17th March will definitely run. It leaves the Merseyrail Community Stadium at 10.45am and costs £18 for members, £13 for under 16 members and £23 for non-members. Please text Bill Sloan on 07952056385 to book your place. We are looking to run a coach to the match at Blyth Spartans on Saturday March 3. The fare is £25 for members, £16 for under 16 members and £30 for non-members. The coach departs the Merseyrail Community Stadium at 8.45am and is booked with Alfa Travel. Please note that no other pick-up points are available for this trip. Places can be booked by texting Bill Sloan on 07952056385 or by social media. Our coach to the match at North Ferriby United next Saturday is definitely running. The coach departs the Merseyrail Community Stadium at 10.30am with the usual earlier pick-up points. The fare is £19 for members, £14 for under 16s and £24 for non-members. To book, text Bill Sloan on 07952056385.